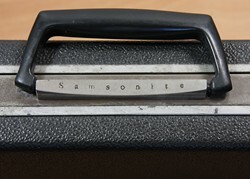 The Samsonite Classic Attaché was such a well-recognised product in the 1960s that the word 'Samsonite' substituted for briefcase, just as vacuum cleaners had become 'Hoovers' thirty years before. It was the attaché case carried by Michael Caine, as Harry Palmer in Funeral in Berlin and in Billion Dollar Brain. James Bond also used one. Sean Connery playing Bond had a Samsonite in You Only Live Twice. The Samsonite Classic's sleek modern style and bulletproof robustness made it an accessory many 60s' businessmen aspired to own. Those in lesser jobs could instantly boost their status with a Samonsite. Like only a handful of products in each era, the Samsonite Classic was the definitive of its type. The story of the Samsonite Attaché and of Samsonite began in 1910 when Jesse Shwayder founded the Shwayder Trunk Manufacturing Company. Shwayder was born in 1882 in a gold mining settlement called Black Hawk, in Colorado, USA. He was one of eleven children of a Jewish shop keeper. It was a hard life and the family struggled to make ends meet. Jesse wanted something better. After experimenting with selling luggage at the family store, he got a job as a salesman for the USA's largest luggage maker at the time, the Seward Trunk Company. He prospered, but always wanted to be his own boss and eventually founded his own business in 1910 working with this father and brothers. After a shaky start, the Shwayder company really took off when Jesse differentiated his suitcases from his competitors by making them stronger. A famous publicity shot shows Jesse, his father and three of his brothers stood on a plank on top of an open Shwayder case. Strength and durability has become a key part of the Samsonite brand ever since. The name is, of course, derived from the biblical strongman, Samson, and was first used in 1941. In spite of his advancing years, Jesse still led Shwayder Bros in the 1950s and the firm continued to innovate. With the dawn of the jet age a new suitcase was needed. The firm worked with industrial design consultant, Melvin Best, to design the Samsonite Silhouette suitcase, which was launched in 1958. It was a suitcase with a magnesium frame and plastic shell, and was instantly the most modern looking suitcase you could buy. Jesse Shwayder stepped down as president in 1960 handing over to his son, King David Shwayder, but the company continued to look for new innovative products and new markets. As well as luggage, Shwayder made folding furniture and Lego for the US market. Having produced a world class suitcase, the Shwayders wanted an attaché case for the jet age. Working to a brief to design a modern case, Shwayder employee, Willard G Axtell, teamed up with the industrial designer, Clair A Samhammer, of Melvin Best Associates. Axtell had already patented a number of inventions, including some bomb disposal equipment for the government, as well as filing the patent for the Silhoutte. Samhammer had worked for motor stylist, Harley Earl, and had designed the Corvette pedal car. The two of them were to produce one of the most definitive products of the age. Their new design, the classic attaché case, combined strength and lightness. It did this through the choice of a modern material, magnesium alloy, for the frame. The hard shell was made from PVC, and departing from a pure modernistic design aesthetic, they gave it a simulated leather affect. Although not purely minimalist, this finish did make it less likely to show scuff marks. The case closes leaving a V-shaped channel at the top. The locks sit in this channel and do not protrude, thus making a neat, elegant design and at the same time protecting them from damage. The interior of the first version was very spartan, with only a vinyl document folder in the lid. Positioned near the top of the market, the Samsonite Classic caused a sensation when it was launched, and it divided taste between those who preferred traditional leather and those who wanted the latest modern efficiency and durability. It quickly became the status case to own. There is one quality above all others which marks out a desirable product from the run of the mill and that is durability. Aside from the practical merit of never needing to replace it, there is something particularly endearing about carrying an ancient case that might have a few dings, but nevertheless still does its job just as well as the day it left the factory. Samsonite products have always had this quality and it was played on strongly in the company's advertising. In one French advert a well-built man stands on top a of a Classic Attaché to reach a book on a high shelf. More to the point, in a UK advert a group of business men are show waiting at bus stop in four drawings showing the passing of time. In the last one they are all skeletons and the one who bought a Samonite still has his briefcase. It was this indestructibility that appealed to the well-healed schoolboys of New York's exclusive Browning School. Around 1966 they ditched the traditional satchel in favour of executive style briefcases, and the Samsonite was a popular choice. and five colours: jet black, deep olive, scotch briar, Oxford gray and saddle tan. The black is by far the most common. In the 1960s import restrictions in commonwealth countries meant that Samsonite cases marketed in Canada were mainly sold in the UK. From the 1970s they were also manufactured in Belgium for the European market. Over its life the Classic Attaché went through four model changes. (*)In 1972 Charles J Scott filed a patent for an orientation sensitive latch mechanism. Remember what happens if you open a brief case upside down. With a Samsonite this was easy as the case was symmetrical. The new latch meant it would not open upside down. From 1965 Samsonite introduced a cheaper model, the Signat in two sizes, Envoy (3 inch width) and Suburban (5 inch width) as well as a new design based on the Classic called the Royal Traveller, which had a recessed handle. 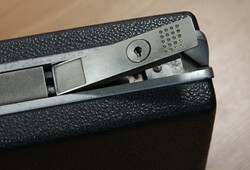 In 1972 the a new model, the Samsonite Classic 100, with a combination lock joined the line up. By the 1980s the Samsonite, with its modernist design was looking bit out of place in the postmodern world and it quietly disappeared. However, with retro in vogue the Classic is back and in 2010 Samsonite celebrated its 100th birthday with a new model, the Samsonite Attaché Centenary, unfortunately though only for the Japanese market.